Recently, the data for the UK economy has been very strong, and it is very clear that the UK economy is in recovery. So what is the reason? Well, you guessed it – monetary policy. I think it is fairly easy to understand this recovery if we follow the money trail. It is a story about how UK households are reducing precautionary cash holdings (in long-term time deposits) because they no longer fear a deflationary scenario for the British economy and, that is due to the shift in UK monetary policy that basically started with the Bank of England’s second round of quantitative easing being initiated in October 2011. The graphs below I think tells most of the story. Lets start out with a series for growth of the Divisia Money Supply in the UK. Take a look at the pick-up in Divisia Money growth from around October 2011 and all through 2012 and 2013. Historically, UK Divisia Money has been a quite strong leading indicator for UK nominal GDP growth so the sharp pick-up in Divisia Money growth is an indication of a future pick-up in NGDP growth. In fact recently, actual NGDP growth has picked up substantially, and other indicators show that the pick-up is continuing. 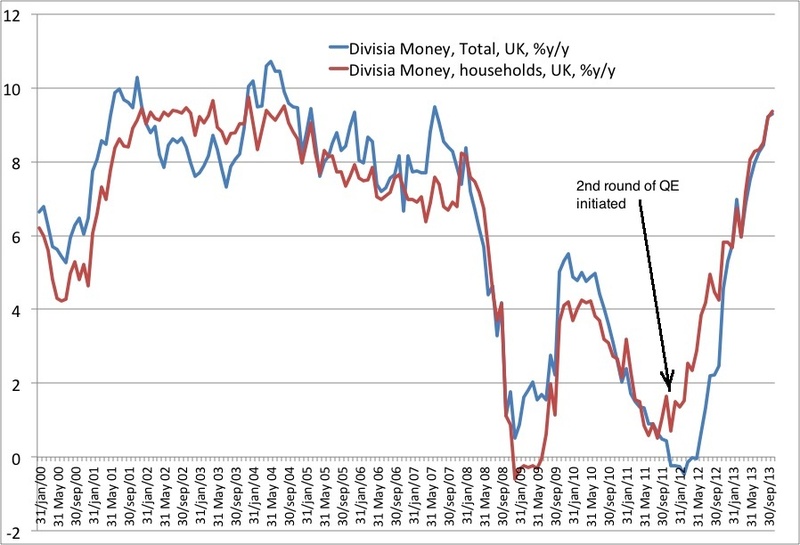 If you don’t believe me on the correlation between UK Divisia Money growth and NGDP growth, then take a look at this very informative blog post by Duncan Brown, who has done the econometrics to demonstrate the correlation between Divisia (and Broad) Money and NGDP growth in the UK. So what caused Divisia Money growth to pick-up like this? Well, as I indicated, above the pick-up has coincided with a major movement of money in the UK economy – from less liquid time deposits to more liquid readably available short-term deposits. The graph below shows this. So here is the story as I see it. In October 2011 (A:QE in the chart), the Bank of England restarts its quantitative easing program in response the escalating euro crisis. The BoE then steps up quantitative easing in both February 2012 (B: QE) and in July 2012 (C: QE). This I believe had two impacts. First of all, it reduced deflationary fears in the UK economy, and as a result households moved to reduced their precautionary holdings of cash in higher-yielding time deposits. 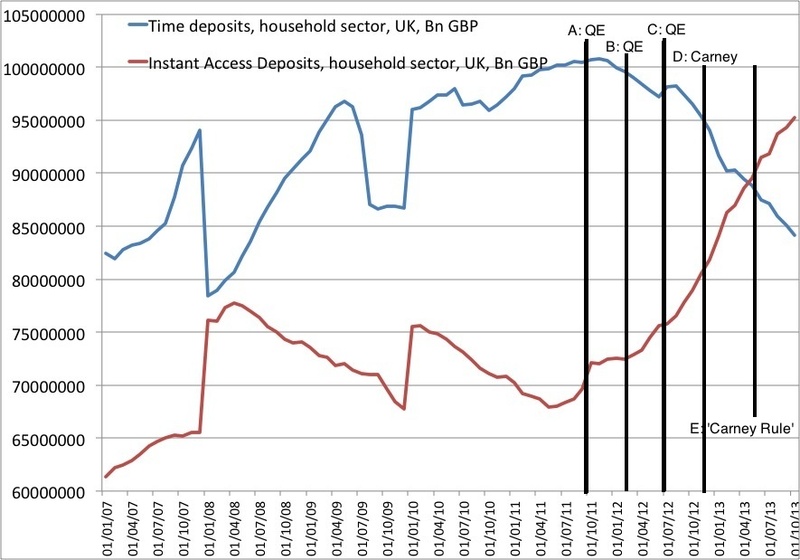 This is the drop in time deposits we are starting to see in the Autumn of 2011. Second, there is a hot potato effect. As the Bank of England is buying assets, banks and financial institutions’ holdings of cash increase. As liquidity is now readily available to these institutions, they no longer to the same extent as earlier need to get liquidity from the household sector, and therefore they become less willing to accept time deposits than before. Furthermore, it should be noted that in December 2012, the ECB started its so-called Long-Term Refinancing Operation (LTRO), which also made euro liquidity available to UK financial institutions. This further dramatically helped the liquidity situation for UK financial institutions. Hence, we are seeing both a push and pull effect on the households’ time deposits. The net result has been a marked drop in time deposits and a similar increase in instant access deposits. I believe it has been equally important that there has been a marked shift in expectations about UK monetary policy with the appointment of Mark Carney in December 2012 (D: Carney). Mark Carney’s hints – also in December 2012 – that he could favour NGDP targeting also helped send the signal that more monetary easing would be forthcoming if needed, as did the introduction of more clear forward guidance in August 2013 (E: ‘Carney Rule’). In addition to that, the general global easing of monetary conditions on the back of the Federal Reserve’s introduction of the Evans rule in September 2012 and the Bank of Japan’s aggressive measures to hit it new 2% inflation undoubtedly have also helped ease financial conditions in Britain. Hence, I believe the shift in UK (and global) monetary policy that started in the Autumn of 2011 is the main reason for the shift in the UK households’ behaviour over the past two years. But you might of course say – isn’t it just money being shifted around? How is that impacting the economy? Well, here the Divisia Money concept helps us. Divisia money uses a form of aggregation of money supply components that takes this into account and weights the components of money according to their usefulness in transactions. Hence, as short-term deposits are more liquid and hence readably available for transactions (consumption or investments) than time deposits a shift in cash holdings from time deposits to short-term deposits will cause an increase in the Divisia Money supply. This is exactly what we have seen in the UK over the past two years. And since as we know that UK Divisia Money growth leads UK NGDP growth, there is good reason to expect this to continue to feed through to higher NGDP growth and higher economic activity in Britain. Concluding, it seems rather clear that the quantitative easing implemented in 2011-12 in the UK and the change in forward guidance overall has not only increased UK money base growth, but also the much broader measures of money supply growth such as Divisia Money. This demonstrates that monetary policy is highly potent and also that expectations of future monetary policy, which helped caused this basic portfolio readjustment process, works quite well. “Monetary” analysis based on looking at interest rates would never had uncovered this. However, a traditional monetarist analysis of money and the monetary transmission mechanism, combined with Market Monetarist insights about the importance of expectations, can fully explain why we are now seeing a fairly sharp pick-up in UK growth. Now we just need policy makers to understand this. I think some acknowledgements are in place here as this blog post has been inspired by the work of a number of other monetarist and monetarists oriented economists and commentators. First of all Britmouse needs thanking for pointing me to the excellent work on the “raid” on UK households’ saving by Sky TV’s economics editor Ed Conway, who himself was inspired by Henderson Economics’ chief economist Simon Ward, who has done excellent work on the dishoarding of money in the UK. My friend professor Anthony Evans also helped altert me to what is going on in UK Divisia Money growth. Anthony himself publishes a similar data series called MA. Second of course, a thanks to Duncan Brown for his great econometric work on the causality of Divisia Money and NGDP growth in the UK. And finally, thanks to the godfather of Divisia Money Bill Barnett who nearly single-handledly has pushed the agenda for Divisia Money as an alternative to simple-sum monetary aggregates for decades. In recent years, he has been helped by Josh Hendrickson and Mike Belongia who has done very interesting empirical work on Divisia Money. For a very recent blog post on Divisia Money, see this excellent piece by JP Koning. And while you are at it, you might as well buy Bill Barnett’s excellent book “Getting It Wrong” about “how faulty monetary statistics undermine the Fed, the financial system and the economy”.